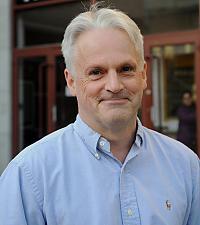 Professor Mike Edwardson is pleased to consider applications from prospective PhD students. 1. The subunit arrangement in ionotropic receptors. 2. The structural changes occurring during receptor activation. 3. The association of sigma-1 receptors with ion channels. 4. The behaviour of proteins involved in membrane fusion during neurotransmitter release. The AFM image shows neurotransmitter-containing vesicles docked at the plasma membrane of a PC12 cell.